Skew and volatility make a perfect match right now in this market -- buying low and selling high is the mantra for all of trading, even with volatility. Now see it in action. We have published several insights over the last two months surrounding market volatility and how it has become a unique opportunity for option traders. We then demonstrated the importance of option skew -- an odd sounding term which is in fact very easy to understand and critically important to successful option trading. Today we take both ideas, and combine them into a custom back-test that buys the depressed volatility and sells the elevated skew to create a direction less option strategy that has seen massive returns since October of 2018, and over the last two-years. Here is the skew for ADBE and SHOP, respectively. This data is provided by CBOE Livevol. The skew shape is in fact normal, with the lower strike prices (out of the money puts) showing higher volatility than the at the money strikes. What is a bit abnormal is how pronounced that slope to the downside has become. What we want to do is back-test owning the the at-the-money-options (both calls and puts) to create a straddle. This position benefits from large stock moves in any direction, which is the market we face right now. Then we want to add to that test, selling a put that is up on that skew slope. This is the very definition of buying low and selling high. The result of this long straddle and short put reduces the cost of a naked long straddle, meaning the stock has to move less for the overall position to be profitable. We will examine the outcome of going long a short-term at-the-money (50 delta) straddle, in options that are the closest to 7-days from expiration. But we have a rule -- it's a stop and a limit of 20%, and, we back-test re-opening the position immediately, as opposed to waiting for 7-days later. That's long an at-the-money (50 delta) straddle and short one out-of-the-money (15 delta) put. At the end of each day, the back-tester checks to see if the long straddle is up 10% or down 20%. If it is, it closes the position, and re-opens at the same time, another long straddle, but this one now re-adjusted for what is the newest at-the-money strike price. The plain English explanation of setting a looser stop loss (20%) to the limit gain (10%) is as follows: "If it didn't work today, we'll see if it will work tomorrow." That has been a steady dose of winning back-tests in this market. If one-day is calm, there's a good chance, soon enough, a volatile day will follow. We back-tested this only over the last nine-weeks. We are hyper focusing not on a long drawn out pattern, but rather this time, right now, this period of volatility. Take well bounded risk, small, and direction-less, and let a tweet, a news headline, an Apple headline, a day of pessimism or a day of optimism, whatever -- move the market, as it has so often in this new volatility regime. Then sell higher priced volatility offset the cost of that initial position. This is how people profit from the option market, its empirical testing, not luck. 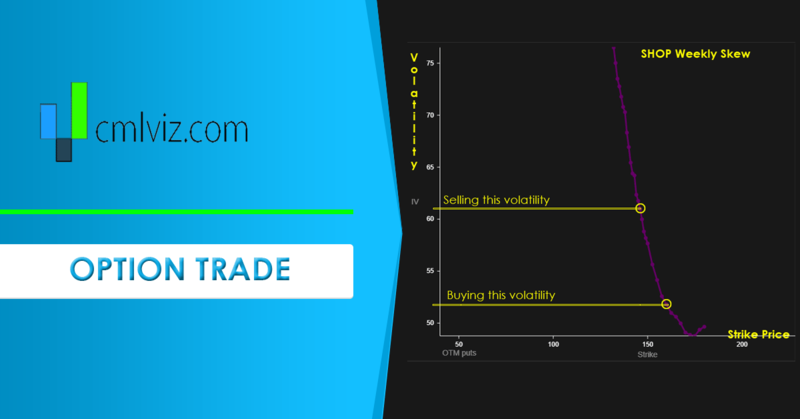 Trade Machine gives you the capacity to trade beyond luck. Can you imagine the other custom strategies we test?